There is a great deal of confusion over the act of ‘jailbreaking’ a cellphone, and it’s certainly not made any clearer by the cellphone carriers who want you to stick with them for the full term of a 24 month contract. 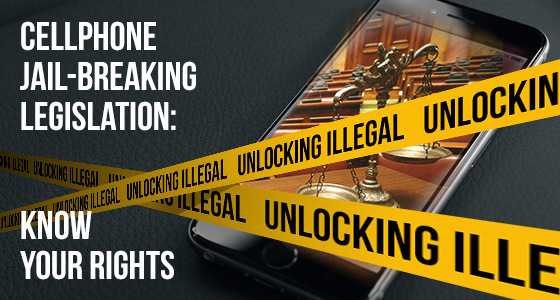 According to U.S. wireless carriers, unlocking a phone bought after January 26 2012 without your carrier’s permission violates the Digital Millennium Copyright Act (“DMCA”) whether the phone is under contract or not. However what this really refers to is the fact that the DMCA prohibits “circumventing” digital locks that “control access” to copyrighted works including movies, music, books, games, and software. In fact this broad and vague ruling bans a lot of useful, and important activities, however, there are exemptions for mobile phones to run unapproved software, and for using clips from DVDs and internet video in non-commercial videos. Really? Who cares? The vast majority of people who want to jail-break their phone wish to do so in order to avoid lengthy contracts that do not best suit their needs, and they feel locked into a bad relationship. Unfortunately, wireless carriers such as AT&T, and many others, do not have much sympathy if you want to end your contract. You need to pay an Early Termination Fee, which of course has its own acronym, (ETF) that can add up to hundreds of dollars. In fact AT&T and most major carriers, such as Sprint and Verizon, will charge you an ETF of up to $350, unless you happen to cancel within the first two weeks. T-Mobile users pay up to $200 depending on how many days are left on their contract. But the reality is, you can still break free or jail-break without handing over rip off penalty fees for the simple reason that carriers are unlikely to start suing customers en-masse. Here are some crafty ways to get out of a contract that is holding you back. This is probably the simplest and most permanent solution of them all. In minutes and for a low cost, online cellphone unlock services such as UnlockBase can send you a code that unlocks your phone so that you can use it SIM free and choose any SIM free plan that takes your fancy. It’s quick, easy, safe and comprehensive, as UnlockBase offers a huge database of phones and service providers from around the world that they can unlock. You read it correctly. If you want to get out of your contract plan there may be someone interested in buying yours. Sites such as Cellswapper or Trade My Cellular specialize in this. They have found a loophole in most carrier’s rulings that means your carrier will only charge you an Early Termination Fee (ETF) if you do not have somebody to pay the monthly fees for the remainder of the contract. So if you can find someone to take over your plan, this will not violate your terms of service as the other party is fulfilling the terms of your original contract. This means you can also test another carrier’s service. You can trade contracts with someone for 3-6 months and see if you want to jump to that carrier. Keep abreast of changes to you contract. Cellular carriers regularly make “material changes” to a contract. A material change can be anything from additional service or maintenance fees, to adjustments in the rates you’re charged, or changes in discounts applied to your account. Should you spot a material change, you should be able to contact customer service and end your contract. Cellbreaker helps track these sorts of changes so you can break your contract. Yes, it’s true. Did you know that some smaller carriers such as Virgin Mobile, Credo Mobile, and Boost Mobile will let you prepay or pay by the month? Some of these carriers will even pay your cancellation fee for you, and you may even be able to keep your phone too! T-Mobile even promises to pay up to $650 to cover the costs of your Early Termination Fee (ETF) if you switch to one of its plans. A useful option if you just want to switch. Don’t be held back by a cellphone contract you no longer want, get creative and unlock your phone!